With our unique clamping system the upper injection molding. 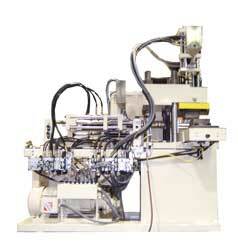 This machine has one vertical and one horizontal injection unit with a left/right shuttle on a “C” frame press. It’s purpose is for added versatility in a laboratory prototyping or production environment.